Sheppard Air Force Base is a United States Air Force base located in Wichita Falls, in Wichita County, Texas. It is the largest and most diversified training center in Air Education and Training Command. The base is named in honor of Texas Senator John Morris Sheppard, a supporter of military preparations before WWII. Sheppard has been providing instruction in Air Force specialties for more than half a century. Though the mission has changed several times, Sheppard has always been in the training business since it was officially opened as an active Army Air Corps base in October 1941. 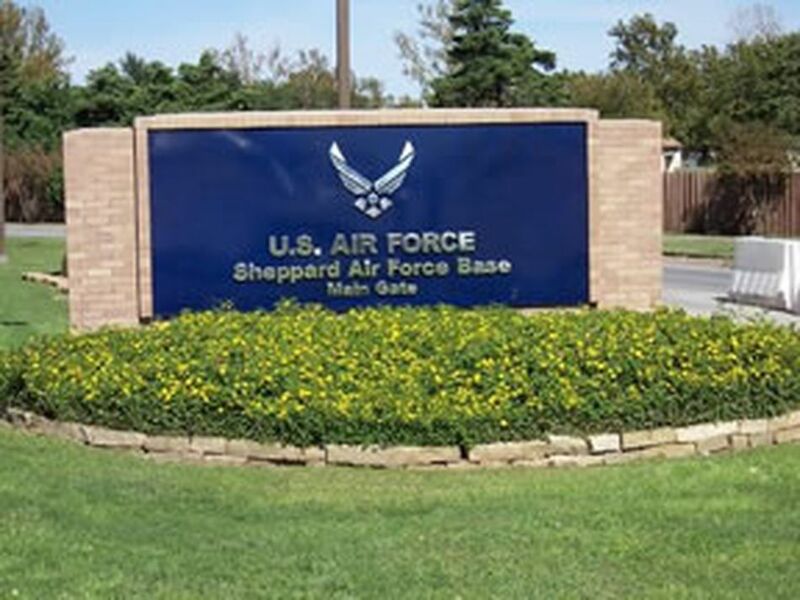 Sheppard AFB is in Wichita Falls, Texas, and situated approximately 130 miles between Dallas and Oklahoma City. At present, the only commercial airline serving Wichita Falls Municipal Airport is the American Eagle. Commercial taxi service is available from the airport to the base (approximately two miles). If your flight takes you to the Dallas/Fort Worth Airport, van or air transportation is available to Sheppard AFB. If you are arriving by personal vehicle, all highways leading to the base are well marked. The main gate is on State Hwy 240, off I-44 (U.S. Hwys 287 and 281). The Missile Road exit off I-44 may also be used to arrive at the base. Visitors passes for privately-owned vehicles can be obtained at the Visitor's Center outside the main gate. If arriving by bus, you will get off at the Texas-New Mexico & Oklahoma Coaches bus terminal located at 1406 14th Street. Sheppard is located six miles from the bus terminal. Take Broad Street (U.S. 287N) until you see signs for Sheppard AFB. Wichita Falls and the outlying towns are largely populated by military retirees, providing a large customer base for Sheppard personnel. Over 20,000 permanent party, airmen in training, and support personnel are on Sheppard AFB during a normal duty day. Reservations for lodging at the Sheppard Inn can be made as soon as you know the date of your arrival. Reservations may be made by calling Phone: (940) 676-2707/(940) 676-2970 DSN: 736-2707/736-2970. Kennels for pets are provided near some temporary lodging facilities, but there are a limited amount of units available. Make reservations as early as possible when traveling with pets. The Units can be quite small in the temporary lodging facility (FLF). All ranks on leave or official duty are allowed to stay in the facilities. Families PCSing in can stay 30 days; families PCSing out are limited to 7 days. BAH must be forfeited for any nights in excess of 30 unless a hardship is approved by Installation Commander. For guests requiring to stay more than 30 days, an extension letter must be given to Lodging administration at least two weeks prior to an extension. There are 2,711 visitor units; 80 temporary lodging units. Sheppard Air Force Base has 867 military family housing units in three separate housing areas: Wind Creek Village, Heritage Heights and Freedom Estates. Housing became privatized in February 2007 and Balfour Beatty Community Housing is now the base housing administrator. Floor plans vary from two, three and four bedroom units. Each unit is equipped with dishwasher, stove, refrigerator, garbage disposal and central heat and air conditioning. Personnel being assigned to Sheppard should initiate housing arrangements as early as possible. On-base housing may or may not be immediately available for new arrivals due to the time of year and ongoing construction of new units. Normally there is not a wait for incoming personnel to move into a home on base. Depending on the time of year you move to Sheppard Air Force Base, it is possible to move into base housing the same week. Unless absolutely necessary, airmen coming to introductory tech training and those other members attending tech schools at Sheppard should NOT bring their families. Single senior airmen and lower-ranking airmen are required to reside in dormitories unless special permission is obtained to reside off base. Dormitory space is available so previous duty station conditions which may have allowed off-base residency do not apply. Storage of excess household goods is provided. There are wheelchair accessible and special needs adapted units available on Sheppard Air Force Base. Contact the Housing office to discuss your special needs or requirements. The Child Development Center at Sheppard AFB cares for children from six weeks to eight years old. There is also an enrichment program available for pre-school children ages three to five years old. Hourly care is available with reservation from ages one to five years old. There are a variety of payment options available. Normal hours of operation are Monday through Friday, 6 a.m. to 5:45 p.m. for children six months to five years old. For children 6 weeks to 6 months old, the hours of operation are Monday through Friday, 6:30 a.m. to 5 p.m. The CDC is closed weekends and holidays. For more information, call (940) 676-2038. When the Child Development Center is full, a waiting list will be used to place eligible children. Referrals may be made to the Family Child Care Program while waiting for a slot at the CDC. The Family Child Care offers care for children of active duty and retired military members, DoD and NAF employees and contractors. Programs offered for children two weeks to 14 years old are full-time, part-time, drop-in, infant, evenings, weekends, extended duty, volunteer and PCS. The program is administered through the family day care coordinator. It provides licensed child care in base housing units under Air Force guidance and training programs. The 82nd Mission Support Group commander grants the privilege to people in base housing who want to provide service to other Air Force families. For more information, call (940) 676-4237. Before-and-After School Programs are offered by the Youth Center on base. The Youth Center offers this program for children ages Kindergarten through 6th grade. For further information, contact the Youth Center. Two school districts serve the three Sheppard housing areas (Wind Creek Village, Heritage Heights, and Freedom Estates). Freedom Estates children attend schools in the Burkburnett Independent School District. Kindergarten through 6th grade attend the John Tower Elementary School, which is within walking distance. Junior and senior high school students are transported by bus to schools in nearby Burkburnett. Children residing in Wind Creek Village housing attend schools in the Wichita Falls Independent School District. Elementary students attend Sheppard Elementary School, located in the housing area. Other students are bused to nearby Kirby Junior High School or Hirschi High School. Children living in Heritage Heights are transported by bus to either the Wichita Falls or Burkburnett schools, depending on the specific location of their assigned housing. Families who temporarily reside at the Temporary Lodging Facility (TLF) are eligible to enroll their children in Sheppard Elementary School. Once families move out of TLF, they may request to keep their children in the Sheppard Elementary School or move to another school in their new attendance school zone. Transfers to Sheppard Elementary School are based on availability, so this option is not guaranteed. Sheppard Elementary serves those children residing in Wind Creek Village and south Heritage Heights. Military families residing in Freedom Estates and north Heritage Heights (Burkburnett ISD) may also attend Sheppard Elementary by completing a school transfer. The Wichita Falls Independent School District (WFISD) utilizes the Controlled Choice Program to improve racial balance in all schools for grades 7-12. New students and parents should report to the Student Assignment Office where they will complete a Choice Form and provide proof of residency. The Student Assignment Office is located at 1104 Broad, Room 300, Wichita Falls TX. Brochures for Controlled Choice and each magnet program are available by contacting your squadron sponsor, the Sheppard Airman and Family Readiness Center Relocation Office, or the Wichita Falls Independent School District at the numbers listed below: SAFB Relocation Assistance at 940-676-4358 or DSN 312-736-4358; Student Assignment Coordinator at 940-720-4966; Magnet Programs at 940-720-4988; Director of Special Education at 940-720-3110. There are a number of private schools in the area. Two universities and a junior college are conveniently located for adult education. Wayland Baptist University and Vernon College offer classes in Wichita Falls and on Sheppard Air Force Base. Vernon College is conveniently located on Midwestern Parkway just across the street from Midwestern State University. All colleges offer online classes. The Family Practice Clinic at Sheppard AFB is open Monday through Friday, 7:30 a.m. to 6 p.m., Saturday, 7:30 a.m. to noon and closed on Sunday. Patients are seen by appointment only. Family Practice Clinic focuses on comprehensive primary care. Primary care managers (PCMs) will see patients to facilitate their care and coordinate with other medical resources as necessary to ensure proper treatment. Family members have full access to the health resources of the 82nd Medical Group Clinic. A parent or legal guardian must be present and give consent before a child under the age of 18 can receive medical treatment for even minor conditions. Patients with acute oral pain, swelling, bleeding or severe dysfunction may call the dental clinic for an appointment at 7:30 a.m. or 1 p.m. Emergency care is provided to relieve pain and suffering and does not always include definitive procedures such as permanent fillings, denture repairs or walk-in examinations. Non-active-duty beneficiaries with family member dental insurance are normally referred to a civilian provider for definitive treatment under the dental insurance plan. Active duty members and those with severe or acute problems have priority. Patients in need of after-hours dental care will call the central appointments phone number (940) 676-1847. Patients are seen by appointment only. Appointments are available 24 hours a day, seven days a week, 365 days a year, online at www.TRICAREOnline.com. Appointments can also be made by phone through our 24/7 appointment line at (940) 676-1847. Those requiring immunizations should call (940) 676-3757. Anyone currently being seen at the aerospace medicine flight should call (940) 676-6509. Appointments could be affected the first Thursday of each month due to medical readiness training for all 82nd Medical Group personnel. Non-prior-service students and TDY personnel are seen by appointment at the Student Health Clinic. Appointments are available weekdays, 6 a.m. to 5 p.m. The student, the student's military training manager or instructor supervisor can schedule appointments.